Note : The information provided in this page come from Duccio Vitale himself. I want to thank him for his contribution to the success of this exciting game. 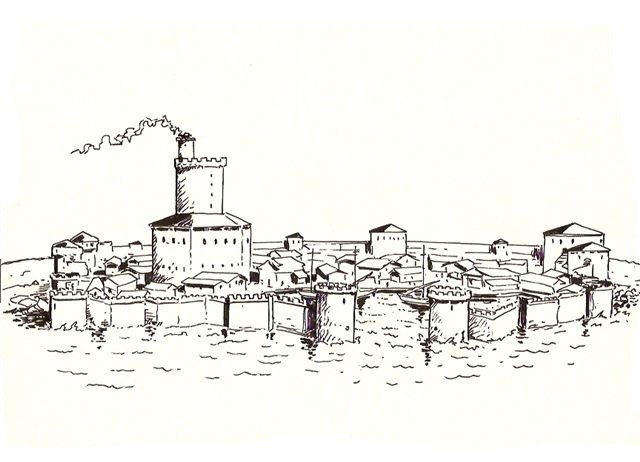 The FORTIFIED HARBOR was an extension designed for VIKINGS. It has never been released due to technical issues. General design was almost completed, but the translucent film used for the black line drawing had slightly stretched in passing in a machine of reprography, probably under the influence of the heat. This technique, used at that time for large size comic books, allowed for obtaining printing in invisible blue on typical drawing paper, to make the coloring process easier. This technique had already been used without any problem for the maps of VIKINGS. For this reason, no duplicate of the films had been made initially. The stretching of the transparent films made the final printing impossible, due to the gap between the black and the other colors. Duccio Vitale had no financial means to redo all four maps and the project aborted. The FORTIFIED HARBOR is made of 4 maps designed by Jean Michel Clément. The harbor itself spreads over 2 maps, with its dock and pier, and it is protected on the sea side by 2 walls with towers. The small adjacent town includes a temple and medieval gardens. On both sides of the harbor, the coast hexes are designed to match the coastal hexes of the maps included with VIKINGS. The major buildings are named the King's Gate, the Merchants' Gate and the Lion's Tower. - Both land maps of the harbor can also be assembled with both opposite maps of the medieval town to build a smaller fortified town. The junction between the maps is not made in the middle but at the level of the dungeon to get a slightly smaller dungeon and without a second round of circular walls. I created 5 (small) counter sheets from the original drawings intended for the game. Combat classes are similar to VIKINGS, with the addition of Militians (that Duccio called Pikemen, but I changed their name to avoid confusion with the P of Peasants), Nobles and Sergeants. Civilians are very varied, with one bishop, one Mbnk, 2 merchants and 3 women. Note that their costume looks More 14th Century to me than the Saxon era!. All names are those that were intended for each class of character. Combat values are consistent with the ones used in Vikings. Sc1 - The Sack of Southampton : 980 - A Danish fleet enters the harbor of Southampton with an easy goal in mind: Sack and ransom! 1147 The Siege of Lisbon: Anglo-Norman, German and Flemish Crusaders on their way to the Holy Land help Alfonso of Portugal to reconquer the city of Lisbon held by the Moors. Rolfr's Saga: This campaign stages the various attempts by the Jarl Rolfr to seize the treasure of Bishop Aldemar. But the wily Earl Godwyn will come up with a lot of ideas to stop him. Below are the first 4 scenarios which use the 4 new maps that are now available in the Shoppe. v1.0 - 06/02/2013 - New !